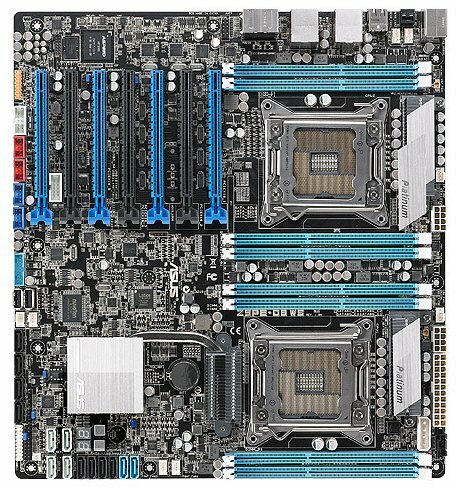 TPU reports ASUS has officially released the Z9PE-D8 WS, a new workstation motherboard made for a pair of Xeon E5-2600 series processors. The board uses the Intel C606 "Patsburg" chipset, it has an EEB form factor (305mm x 330mm) and has four DDR3 memory slots per socket, supporting up to 256GB of registered DDR3 memory. Expansion slots include four PCI-Express 3.0 x16 (blue), two PCI-Express 3.0 x16 (electrical x8, top two black), and one PCI-Express 2.0 x16 (electrical x4, bottommost black). 4-way SLI and CrossFireX are supported. Storage connectivity includes six SATA 6 Gb/s (two from the PCH, four from two Marvell 9230 chips), and eight SATA 3 Gb/s (all from the PCH). An ASPEED ASMB6 provides basic display and iKVM functions. Realtek ALC898 provides 8-channel HD audio. There are two gigabit Ethernet interfaces, driven by Intel 82574L chips. The Z9PE-D8 WS from ASUS is priced around US $630.